My friend and colleague, writer and social activist Sophia Dembling is one of the wittiest people I know. She is a straight shooter and speaks her truth. I first met Sophia (or “Sophie” as some call her) 9 years ago when my first book, The Introverted Leader was published. There were only a handful of people writing about the topic of introverts and she quickly became one of my favorites. 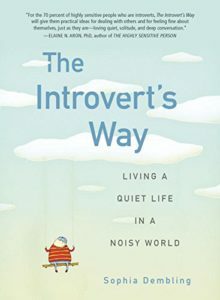 Her first book, The Introvert’s Way: Living a Quiet Life in a Noisy World reflects a sharp wit and unparalleled honesty about the introvert experience. I have also gained perspective from Sophia’s sharp commentary on her Psychology Today blog. She has a way of explaining research so that it makes perfect sense. Sophia pulls back the covers and asks us to question the conclusions of studies we might otherwise take for granted. After several years of corresponding via email, we finally met in person over margaritas in her adopted hometown of Dallas, TX. In addition to our mutual interest in writing about introverts, we discovered that we both were native New Yorkers and had fathers who were writers. We also both love to travel. In sum, as an extrovert and introvert, we were genius opposites, more alike than different. One rainy afternoon two weeks ago, I sat on my couch responding to her questions about introverted leadership. Sophia has recently become more politically active and is experiencing some ambivalence and a steep learning curve as she moves into new leadership roles. She knew that I had just finished an updated version of The Introverted Leader and was always eager to “riff” with her. We discussed some lessons that she has found hard to swallow, like asserting herself with a volunteer who bailed on an important commitment. For someone who doesn’t like to be around people 24 – 7, Sophia feels particularly challenged. As a good journalist does, she somehow pulled together the nuggets from our conversation into a coherent essay. I hope it helped her to think about how to use her quiet strength to inspire people..and perhaps you will find some ideas here as well. Good leaders admit that they don’t know it all and are vulnerable. She became reinvigorated when she decided to leave a dwindling volunteer group and put her energy into working for an inspiring political candidate. Dealing with people who are “energy sapping” is hard. When you don’t understand why someone is not following through on their commitment, don’t email – pick up the phone. Read Sophia’s Psychology Today blog here. : Lead or Follow, An Introvert Weighs the Challenge. This entry was posted in Uncategorized on November 23, 2017 by Jennifer Kahnweiler.